We’ve heard reports that internet connectivity in Australia can be an iffy proposition, and [deandob] seems to back that up. At the limit of a decent DSL connection and on the fringe of LTE, [deandob] decided to optimize the wireless connection with this homebrew Yagi antenna. Officially known as the Yagi-Uda after its two Japanese inventors from the 1920s, but generally shortened to the name of its less involved but quicker to patent inventor, the Yagi is an antenna that provides high gain in one direction. That a homebrew antenna was even necessary at all is due to [deandob]’s ISP using the 2300MHz band rather than the more popular 2400MHz – plenty of cheap 2.4GHz antennas out there, but not so much with 2.3GHz. 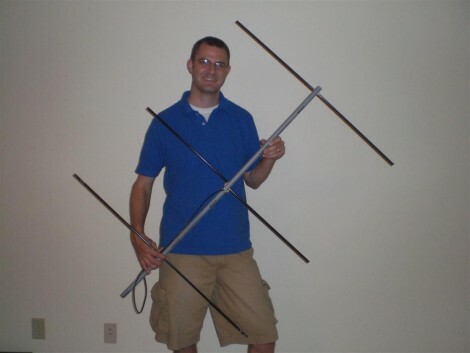 With multiple parallel and precisely sized and spaced parasitic elements, a Yagi can be a complicated design, but luckily for [deandob] the ham radio community has a good selection of Yagi design tools available. His final design uses an aluminum rod for a boom, 2mm steel wire for reflectors and directors, and a length of coax as the driven element. The result? Better connectivity that pushes his ISP throttling limit, and no more need to mount the modem high enough in his house to use the internal antenna. People on the fringes of internet coverage go to great lengths to get connections, like this off-grid network bridge. Or if you’d rather use a homebrew Yagi to listen to meteors, that’s possible too. [Tommy Gober] built this Yagi-Uda antenna that has some handy design features. The boom is a piece of conduit with holes drilled in the appropriate places. The elements are aluminum arrow shafts; a good choice because they’re straight, relatively inexpensive, and they have #8-32 screw threads in one end. He used some threaded rod to connect both sides of the reflector and director elements. The driven elements are mounted offset so that a different machine screw for each can be connected to the appropriate conductor of the coaxial cable. The standing wave ratio comes in right where it should meaning he’ll have no trouble picking up those passing satellites as well as the International Space Station.